Q: The display console on my 2014 Chevrolet Cruze says I have 37% oil left. How often does my oil need to be changed? What are the limitations as to how low that percentage can go before it’s critical? A: Your vehicle’s electronic oil reminder uses a custom algorithm to determine the life of the engine oil. The parameters include starts, run-time, and mileage. I wouldn’t go less than 10% oil life (you will get an additional warning when an oil change is necessary) or longer than 12 months. 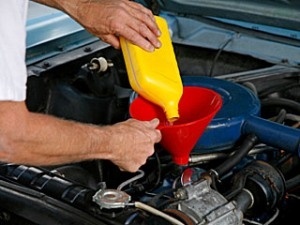 As important as oil changes are, checking the level of engine oil is critical. Today’s engine will use some oil between changes and operating an engine low on oil will cause excessive wear. Q: What are the most reliable tires for year-round driving here in the Northeast? My vehicle is a 2015 Honda CR-V and I don’t want to deal with snow/winter tires. A: All-season tires, like those on your CR-V, will perform fairly well in up to six-inches of snow. There is no substitute for winter tires; but if you don’t need to be on the roads before the plows are out, chances are the combination of all-wheel drive and all-season tires will give your CR-V the winter traction you need. Q: I have a 2015 vehicle that has gone through four low-beam headlight bulbs in the last year. For safety reasons, I keep the headlights on all the time while driving about 20,000 miles each year. Any reason why this might be happening? A: I’m assuming your shop is using quality bulbs and have checked the writing. Higher-than-normal voltage is a common issue and can shorten bulb life, so have them check the voltage level. If it seems normal, ask if the technician can wire a volt meter into the headlight system. You may see occasional voltage spikes that could be damaging the bulbs. Q: The touch-entry keypad on my 2014 Ford Escape stopped working. The Ford dealer said it was most likely the touchpad. Can this be checked using diagnostic equipment and is there a module involved with the keypad? A: The touchpad is connected to the body control module, as is the remote keyless entry system. The system can be checked for diagnostic failure codes and the wiring to the door could also be a problem Since the power locks and keyless entry systems work, it is most likely a problem with the keypad. The keypad costs less than $80 and will take about an hour to change it. Q: I recently purchased a used 2002 Kia Soul with a 6-speed manual transmission. It has everything I need except cruise control. I’m on the highway a lot and cruise control is helpful. Is there an aftermarket remedy for adding cruise control to this vehicle and is it worth the expense? A: There are aftermarket cruise control systems that work pretty well. And since your car uses an electronic throttle, it is a fairly straightforward installation. The kits sell online for $300 or so, and I would guess a half day of labor for the installation of the hardware.